Save Tidemill campaigners met with the new Mayor of Lewisham Damien Egan and new Cabinet Member for Housing Cllr Paul Bell on Tuesday evening to demand that the redevelopment plans for Tidemill be re-drawn and that Reginald House residents, whose homes will be demolished as part of the plans, are given a ballot on the regeneration of their homes. Before and during the meeting protesters staged a demo outside Lewisham Civic Suite, with their numbers swelling as night fell. The meeting and protest came the day after a small group of Save Tidemill members, accompanied and supported by GLA Member for Lewisham & Greenwich Len Duvall, met with the Deputy Mayor of London for Housing James Murray to discuss how the GLA might 'call in' the scheme in order to explore alternative options that took the local community's needs into account. 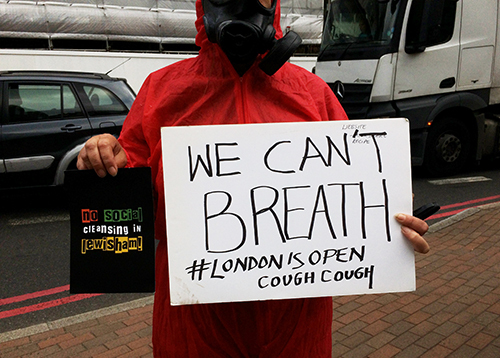 But later on the same day, to Len Duvall's great annoyance and campaigner's disappointment, the Mayor of London announced his final word on the scheme and passed it back to Lewisham Council, having declined the campaign's request for the GLA to take control of the development. But he also urged the Council to give Reginald House residents a ballot. Monday's GLA report stated, "in line with his Good Practice Guide the Mayor wants to see ballots used as widely as possible, and so he would urge the landlord of this scheme to undertake one”. The GLA signed off on providing funding for much of the affordable housing on the site earlier in the year, which led to Reginald House residents (as one of 34 sites due for demolition across the capital where planning permission has already been granted) being exempted from the new ballot rules when they are implemented. So this was either a cop-out or a challenge to Lewisham Council: if the council is actually behind the idea of ballots (as promised in the Lewisham Labour manifesto), there might still be time to implement one for this scheme. The GLA knew there was still time to change. Although the plan to demolish Reginald House was approved by the planning committee in September 2017, the process is still incomplete and requires a sign off on the Section 106 agreement with the development partners, housing association Family Mosaic (now part of Peabody Homes) and private developer Sherrygreen Homes. In addition, the contract with them was signed 4 years ago this very month and is due for renewal. During that time, Family Mosaic have merged with Peabody. So it sounds like a great time to review the contract, and for a new administration to embark on a bold new plan to get a better deal than the original contract which sees our dear leaders disposing of publicly owned land to private developers for a quarter of its value. Len Duvall also joined and led the meeting with Mayor Egan and Cllr Bell on Tuesday evening on behalf of the campaigners, and opened up the discussion for everyone to speak. 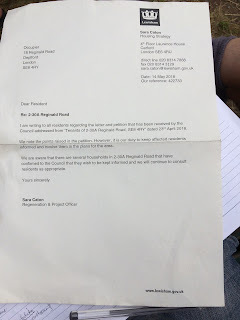 Apart from the demand for a ballot for Reginald House, the main request was that Egan and Bell go back to the drawing board with the plans for the site and not push through the current plans which so many local people oppose. 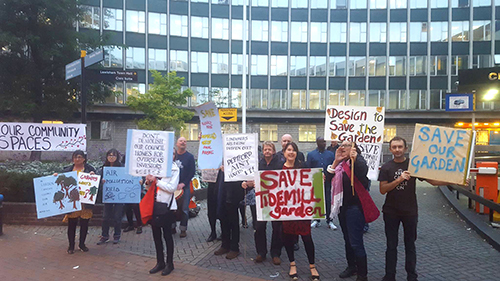 Save Tidemill said their alternative architectural plan for the site (which Egan and Bell seemed unaware of) showed that it is possible to keep Reginald House and Tidemill Garden whilst building at least the same number of units as current plans; it demonstrated that there was another way. Unfortunately, when originally presented to the Council and its partners in 2016, it had been quickly dismissed without any consideration. Monday's GLA report noted that the alternative plan hadn't even passed through any pre-application examination, but in reality this was because the Council hadn't permitted any examination to take place. Save Tidemill told Mayor Egan and Cllr Bell how they have continually tried to engage with the planning process but have been ignored and even sneered at by the Council's development partners. Len Duvall said the community and the residents of Reginald House had been treated appallingly by the Council and this should never happen again. Both Egan and Bell blamed the previous administration for the way things had been handled, with Bell stating he would not entertain the scheme in its present form if it were to come to him now as a new proposal. The fact that the new Mayor was Cabinet Member for Housing in the previous administration and would have therefore overseen the scheme was defended by Cllr Bell with the assertion that the new Mayor will no longer be the sole decision-maker in Mayor & Cabinet, unlike his predecessor, Mayor Bullock. One wonders what exactly Egan was doing all that time as he seemed (as did Bell) not to be at all familiar with any of the details of the Tidemill scheme (other than perhaps the affordable housing quota). Cllr Bell then robustly defended one of the campaigner's claims that making Mayor & Cabinet more democratic made no difference because it was still the same unelected Council Officers who were running the show and lying to Councillors in order to get schemes approved. It was later revealed that Cllr Bell had come to the meeting armed with inaccurate figures prepared by those same officers. 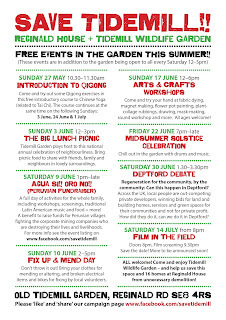 The regeneration plans for Tidemill were drawn up by the Council more than four years ago, in a process which began in 2008 after several permutations looked at how the land at the old Tidemill School could pay for the blingy landmark Deptford Lounge, the development of which LBL had fronted and which the school moved into in 2012 (and promptly became an academy!). The housing element of the scheme was built by Galliard and sold to L&Q and is now known by its tenants as the Titanic as it was so badly built. Two other council blocks in Giffin Street were originally included for demolition in the Tidemill scheme, but were dropped from the final plans due to fierce opposition from leaseholders. In 2014 Family Mosaic won the tender to deliver the scheme and promised to provide 35% affordable housing. However, they were unable to deliver more than 11% (or 16% according to the Council) when the application went to planning in September 2016. This was the main reason it got 'deferred' and sent back to the drawing board by the Strategic Planning Committee. Another year went by while Reginald House residents waited to find out their fate – with their lives, as well as repairs to their homes, on hold. Although very little at all changed on the design of the scheme, the September 2017 application saw quite an improvement in affordable quotas, due to Family Mosaic's convenient merger less than a month before with the much larger Peabody Homes, who have better access to GLA subsidies. The quota rose to 37% (or 41% according to the Council) and the application was passed by 4 out of 6 members of the Strategic Planning Committee (with 3 of the committee being absent!). In the meantime, the GLA policy had changed and they now required schemes to have 50% affordable in order to access funding. So it was another six months before a figure just below 50% (the Council say 54%) was achieved due to the Council accessing its magic money tree and finding an extra £4.2m to contribute to the project in March 2018. As we have written before, none of the figures are publicly available, but it is unlikely that Sherrygreen Homes will be out of pocket and will still make a guaranteed 20% profit on the development, subsidised by public funding. Currently the proposals are for 209 homes, of which 74 would be 'socially rented'. While the tenants at Reginald House have been promised (nothing in writing) that they will pay the same Council rents as they do now, everyone else housed from the waiting list in the new 'social housing' will in fact have to pay London Affordable Rent, which in Lewisham is actually around 37% more. 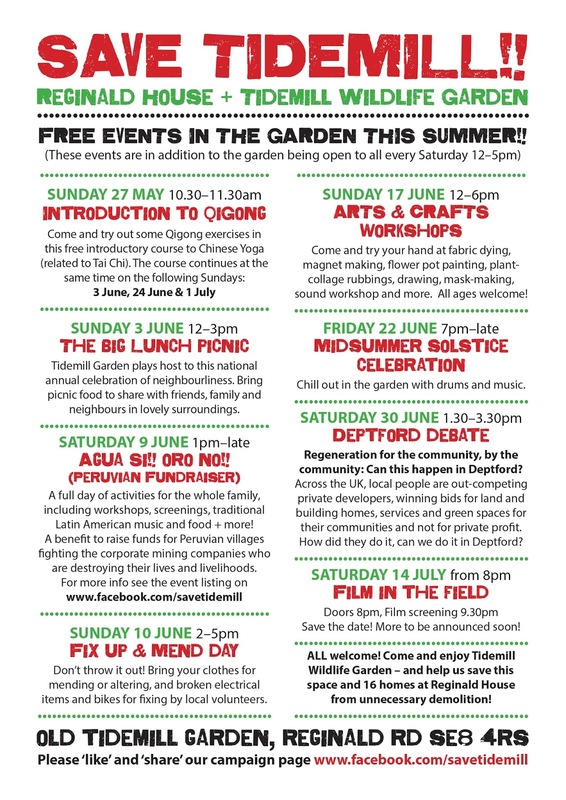 As if you didn't know by now, the Council's plans also require the destruction of the Old Tidemill Wildlife Garden, a thriving 20 year old community garden originally created by children, teachers, and parents from Tidemill School with public funding. When the school moved, the garden was taken over by Assembly SE8 and local volunteers, who developed it into an educational and community wildlife garden that attracted both funding and ultimately accolades from the GLA Greener Cities programme which cited the garden as a case study in August 2017. The planning submission in September 2016 put paid to all this educational and outreach work as who would fund a space that might close at any minute? But volunteers have been trying to keep the garden open ever since with occasional events, and have kept the grounds in great shape. Meanwhile, the Council insists on referring to it as 'meantime use' which negates the fact that it is an open green space that has existed for more than 20 years in an area where green space is being depleted. They even managed to persuade the GLA planning officers that it was merely a bit of brownfield scrubland that local volunteers couldn't manage to keep open regularly enough for it to be considered a public amenity – conveniently forgetting to remind the GLA how one of its other departments have supported and promoted it so keenly. Reginald House residents have been living with the threat of demolition for 10 years. More recently they have been harassed by council officers continually wanting to assess their housing need and to see proof of identity of everyone living in the property. One resident told the meeting with Egan and Bell how she had been racially abused by a council officer when she refused to answer the door to them, news of which appeared to shock them deeply. The Council has not responded in any meaningful way to the residents’ most recent petition (signed by 80% of them) other than by an acknowledgement from the Housing Strategy Team that could be read as a threat to keep harassing them. Pauline, Sonia and Diann asked Egan and Bell not only for a ballot but also for Lewisham Homes to undertake repairs needed to their homes to make them safe and decent. Reginald House is structurally sound and has had a new roof, boilers, kitchens and bathrooms within the last few years. 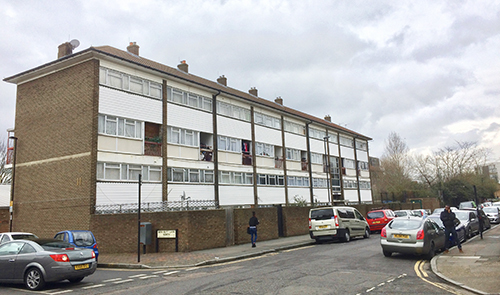 However Lewisham Homes has been ignoring requests for minor repairs, whilst failing to carry out more major refurbishment such as double glazing, external decorations and new fire-safety front doors. This has left the tenants with rotting and drafty windows, blocked sinks, unpainted walls, dangerous electrical powerpoints and other neglected repairs including front doors that not only don't meet fire safety regulations but are also falling off their hinges. After hearing about the harassment by council officers, the lack of formal written offers and the appalling state of non-maintenance of their homes, Cllr Bell told the tenants at the meeting “I personally guarantee that I will look at it myself” before passing the buck to local councillor Brenda Dacres who was also in attendance. God knows how Dacres is going to find time to liaise with Lewisham Homes on tenant's behalf, having just become joint-Cabinet Member for Parks, Neighbourhoods & Transport with responsibilities for "Arts, Sports, Leisure, Culture, Town Centres, High Streets, Night Time Economy Strategy, Parking Enforcement, Highways and Transport". The residents kept saying they did not want to lose their homes and were not interested in the new homes, but Bell's response was to continue to encourage them to consider how they would best like to be accommodated in the scheme – ultimately sounding, in his repetition, not dissimilar to a holiday resort timeshare rep – whilst insisting that “the Council’s biggest priority is its residents”. We have to wonder exactly what Lewisham Homes' role in estate regeneration is. They seem to be complicit in 'managed decline' (when an estate is allowed to get run down over a number of years prior to long-planned redevelopment, a tactic used most often to justify demolition) whilst benefitting from it. An FOI request has revealed that in the time that £104,000 was taken from Reginald House residents in rent and service charges, only £126 was spent on repairs. We have seen the same at Achilles Street in New Cross, where repair expenditure over 6 years was less than £240k while income to Lewisham Homes was over £2.6m, and the Council's plans for that site (the demolition of 87 homes and 15 or more independent businesses) haven't even gone to planning yet. Reginald House residents have heard very little from Lewisham Homes but a lot from Lewisham's Housing Strategy Officers, whose verbal promises have not been supported by written assurances. Tenants fear their close-knit community will be broken up, they'll be given smaller homes, have their rent increased and lose their gardens. Even with the best promises in the world, they don't want to leave the homes that they love. Their roots are not just in the area, but in the very fabric of their homes. Campaigners are hoping that Egan and Bell will spend further time in considering their demands, and come to a more enlightened and progressive view on how the scheme proceeds. Ideally they might reflect on their election pledges to offer ballots to residents threatened by demolition, and not to sell strategic land to developers. Both pledges negate what is happening at Tidemill, and the power is now in their hands to change things. They could pay more than lip service to existing core policies such as Objective 5 (to reduce carbon emissions), Objective 7 (to protect and capitalise on open spaces and environmental assets) and Objective 11 (to strengthen quality of life and well-being). With 79 trees proposed to be felled at Tidemill Garden, perhaps they could also pay attention to their Biodiversity Action Plan in which they promise to "maintain, protect and increase the number and quality of trees in the borough" and that's not even mentioning the full biodiversity of Tidemill Garden, let alone the opportunity it offers local people, especially children, to experience nature on their doorstep, instead of being municipalised into a clinical environment by a remote elite in Catford. In the past, Cllr Bell supported the local campaign "Don't dump on Deptford's Heart" to stop Tideway Tunnel from taking over the green amenity next to St Paul's Church on Deptford Church Street to build a shaft that could have been built by the river. Locals lost that campaign – as well as 44 trees and a large chunk of green. Tideway construction vehicles are now queuing up in a lorry park on Deptford Church Street, adjacent to Frankham House (and opposite Cremer House) with the bus lane disabled, contributing to increased pollution in Deptford Church Street that is unmitigated by the loss of trees at the St Paul's site (till 2022), and will not be helped by the loss of green space at Tidemill. Nor at No.1 Creekside, but that's another urgent post to come. In 2013, while serving on the Strategic Planning Committee Cllr Bell was minded to refuse permission to Workspace plc for their redevelopment of Faircharm Trading Estate. At the meeting he made an impassioned speech about how "Deptford is always being 'done to' – and never 'with' ". 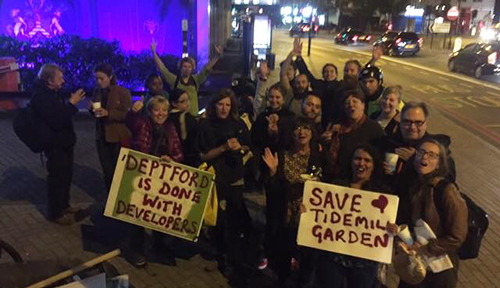 He's now in a better position to stop us being 'done to', but the impression campaigners got at Tuesday's meeting is that there won't be any changes at Lewisham Council that will benefit Deptford any time soon. More on No.1 Creekside – the long read! Object to the No.1 Creekside development!